Fire scientists to Trump: You’re wrong! 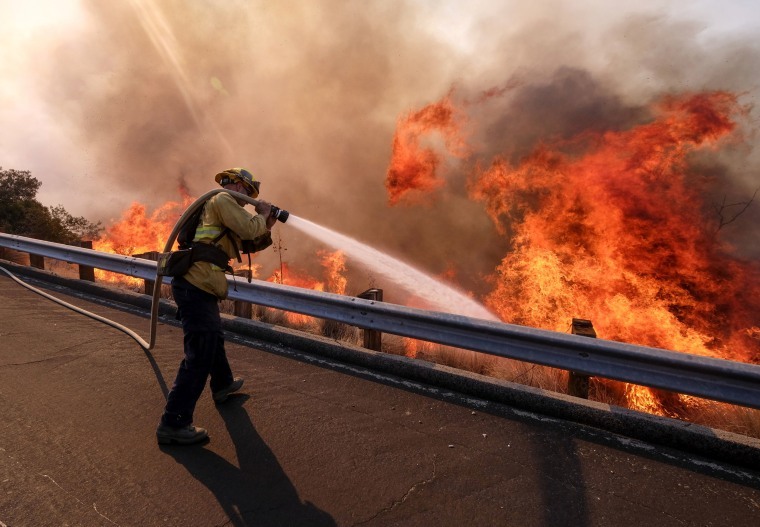 The devastating wildfires that ignited across California last week — killing 44 so far and destroying thousands of homes — had little to do with "gross mismanagement," experts said. President Trump made that claim on Saturday during a trip to France, saying, without evidence, that "there is no reason for these massive, deadly and costly forest fires in California except that forest management is so poor." But scientists and fire officials say that climate change — and the dried out trees and shrubs produced by a changing environment — are the real culprits. Asked about Trump’s claim on Monday, one of the fire officials in charge of battling Southern California’s Woosely Fire, Los Angeles County Fire Chief Daryl Osby, said he found it "unsatisfactory." "We’re in extreme climate change right now," Obsy said. "We’re doing all that we can to prevent incidents and mitigate incidents and save lives." “We’re in extreme climate change right now … I personally find that statement unsatisfactory, and it's very hurtful for all first responders"
University of Utah fire scientist Philip Dennison said that researchers know that mismanagement isn’t to blame because some of the same areas now burning were charred in 2005 and 2008. They aren't "fuel-choked closed-canopy forests," Dennison said. In those earlier fires, Paradise was threatened but escaped major damage, he said. In the current blazes, the town was virtually destroyed. "It's not about forest management," he said. "These aren't forests." As of Monday, more than 13,200 square miles have burned. That's more than a third higher than the 10-year average. The wind is so strong that fire breaks — areas where trees and brush have been cleared or intentionally burned to deprive the advancing flames of fuel — won't work. One of the fires jumped over eight lanes of freeway, about 140 feet, Dennison said. Because of that, there are 129 million dead trees, which provide fuel for fires, said wildfire expert Kristen Thornicke of the Potsdam Institute for Climate Impact Research in Germany. And it's more than trees. Dead shrubs around the bottom of trees provide what is called "ladder fuel," offering a path for fire to climb from the ground to the treetops and intensifying the conflagration by a factor of 10 to 100, said Kevin Ryan, a fire consultant and former fire scientist at the U.S. Forest Service. While many conservatives advocate cutting down more trees to prevent fires, no one makes money by cutting dead shrubs, and that's a problem, he said. Local and state officials have cleared some Southern California shrub, enough for normal weather and winds. But that's not enough for this type of extreme drought, said Ryan, also a former firefighter.